The power of interpretation in activist art hit me recently while I was studying a particularly compelling painting by Mary Britton Clouse. Mary runs Chicken Run Rescue in Minneapolis and has long been a role model for me. Together with her husband Bert, Mary has rescued nearly 1,000 chickens from horrific conditions since 2001. What's less known about Mary is that she's also an incredible animal rights artist. It was while I was preparing for a talk on the power of art as activism that I pulled up Mary's painting. 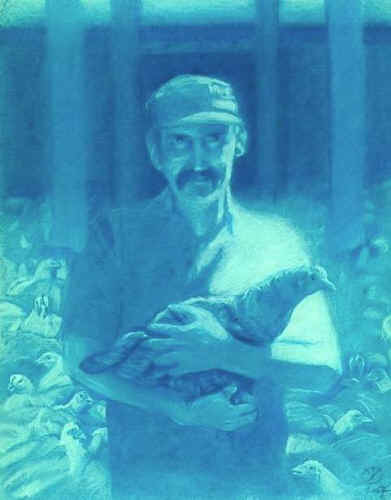 The painting features Virgil Butler gently holding a hen. Virgil worked in a chicken slaughterhouse for much of his adult life. He had an awakening and became a passionate and articulate voice for chickens. Sadly, Virgil isn't with us anymore. He passed away in 2006. Staring intently at the painting, I felt that the cool monochromatic blue represented Virgil's overwhelming sadness and grief for the lives he had taken. The mass of birds in the background fueled that interpretation. He was Picasso's Old Guitarist. Thinking I should double-check my reading with Mary, I contacted her and was stunned to hear the real intention of the painting. It's in fact a piece of tribute art. With this painting, Mary is actually honouring Virgil's courage. In fact, she has elevated him to the level of a saint. The monochromatic, ethereal blue reflects the traditional holy cards of saints, which brought art, personal courage and spiritual triumph together. Those hens in the background? Those are all the hens he's saved since his awakening. Armed with this new-found awareness I scrutinized the painting again and, there it is, Virgil is smiling! He's looking off into the distance with wisdom and yes, a sense of peace. How did I not see it before? But then I realized, either interpretation connects with me and makes the piece personal. And that's exactly what makes art so powerful.